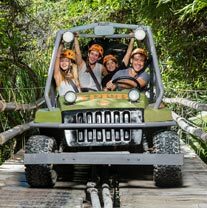 XPLOR is the most famous new theme park in Playa del Carmen, combining the natural attraction of the underground river system and cenotes of the Riviera Maya with a whopping 14 zip lines and 6 miles of amphibious vehicle track. Like the most famous parks in Playa del Carmen, Xel-Ha and Xcaret, Xplor is family friendly and only 10 minutes south of town, so very convenient too. SAVE UP TO 15% ! We offer discounts and deals on all the available tours to Xplor from Playa del Carmen. If you do plan to visit Xcaret, Xel Ha or Chichen Itza, we also have even more deals if you book both with us. Our favorite deal for families, and the biggest money saver is Xplor & Dolphin Swim, which combines two of the best family activities in Playa del Carmen for one amazing price. Kids: Must be at least 5 years old to enter the park. Kids 5-11 years get 50% off the regular admission price. Xplor - Frequently Asked Questions. Q: How far is Xplor from my Playa del Carmen Hotel? A: Xplor is located less than 10 minutes south of Playa del Carmen, making it very convenient for anyone staying in Playa del Carmen to visit. Q: I saw Xplor advertised for only $107.00. Why is your price higher? A: The price you saw does not include transportation from Cancun. It is only for the park entrance with no transportation. Our price includes transportation and an English speaking tour guide on the bus. You will still be on your own at the park, but this is a very convenient way to get there and back. Q: Is Xplor Wheelchair Accessible? A: Mmmm...not really, no. No wheelchairs or scooters are available for rent, and you can't do the activities. There are slippery stone paths you could roll down and watch, but not an ideal tour for wheelchairs or scooters. Xel Ha or Xcaret would be a better bet. Q: Xplor or Selvatica - which is best? Which should I choose? A: That depends which environment sounds more your speed. Both are awesome, they are both very different from each other though. See our comparison chart below to get a quick snapshot of the differences.